Revolabs has launched its new line of Elite Wired Microphones at InfoComm today. The new microphone family is both functional and customizable, allowing conference participants to enjoy optimal sound quality and giving customers the option to match the mic with any boardroom color scheme or design concept. 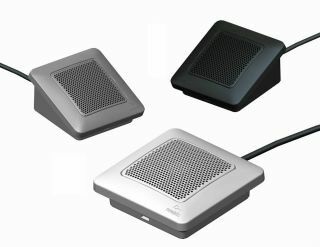 Available in multiple colors, the tabletop Elite Wired Microphones complete Revolabs' cutting-edge sound capture solutions for conferencing and unified communications (UC) applications. "We created the new Elite Wired Microphones to meet the demand for wired solutions that can leverage today's exciting collaborative communication opportunities," said Tim Root, CTO at Revolabs. "The new mics follow the same engineering philosophy as our award-winning wireless microphones while providing users with mix-and-match capabilities in both function and style. The result is a uniform look across conferencing spaces and superb audio capture performance for environments that may not be ideal for wireless systems." The tabletop microphones are available in omnidirectional or directional models. Impervious to GSM noise, the wired microphones also deliver an unmatched signal-to-noise ratio and supported frequency range for best-in-class audio capture performance. An elegant solution at a cost-efficient price point, Revolabs' Elite Wired Microphones satisfy security concerns, reduce AV staff setups and maintenance interventions, and easily integrate with post-audio processing and mixing components to support any UC application. An optional mounting adapter provides lockdown capability for settings requiring fixed microphone locations. The microphones can also be used in tandem with Revolabs' entire wireless solution portfolio — increasing the maximum number of microphones available within a single space while combining wireless flexibility with the security of the wired microphones. Resilient and durable, Elite Wired Microphones complement any conference room aesthetics. Available in a variety of colors including black matte finish, brushed nickel, and white, designers and AV integrators can now match contemporary furnishing and decors from classic wood to chrome and glass while maintaining best-in-class audio quality and performance. Visit Revolabs at booth N1955 at InfoComm 2014.